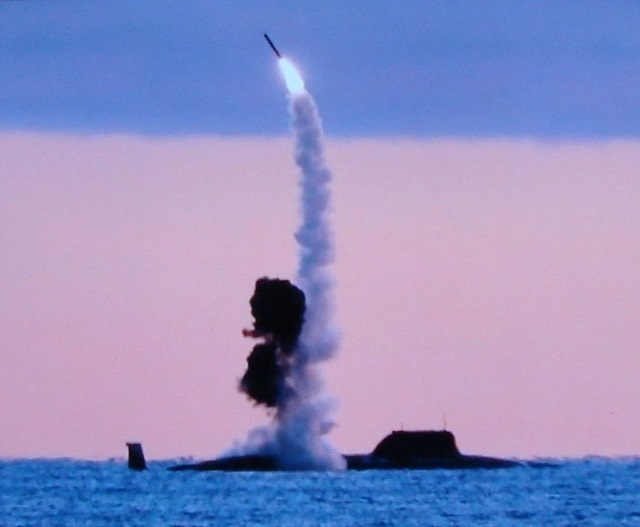 The upgrade of the Project 971 Bars-class (NATO reporting name: Akula-class) nuclear-powered attack submarines will afford them missiles of the Kalibr (SS-N-27 Sizzler) system, Viktor Kochemazov, chief, Training Department, Russian Navy, told the RSN radio channel in an interview on Monday. "Now, the upgrade of the Project 971 submarines provides for equipping them with the missile system," he said. According to Kochemazov, the system "proved itself" during the trials. "Its use by the Rostov-on-Don submarine showed that the system is facing bright vistas in terms of further development," he emphasized. At present, the Russian Navy operates a fleet of 11 submarines in the class, with most of them being in various stages of repair. Actually, only three ships, which are used by the Northern Fleet, are operational. The Pacific Fleet’s four submarines of the class (K-322 Kashalot, K-391 Bratsk, K-331 Magadan, K-295 Samara) are at shipyards for repairs. They say the Kashalot will be leased to India. The Bratsk and Samara have sat at the Zvyozdochka Shipyard since summer 2014, the Kashalot at the Amur Shipyard and the Magadan at the Zvezda Shipyard. K-419 Kuzbass has been released back to the Pacific Fleet recently, while the repair of the Magadan is nearing the end. The Northern Fleet has six submarines of the class, of which three - K-154 Tigr, K-335 Gepard and K-317 Pantera - are operational. Three Project 971 subs - K-461 Volk, K-328 Leopard and K-157 Vepr - are in various stages of repair. The Leopard and Vepr are planned for the return to the operational status as soon as 2016 and the Volk in 2017. The Gepard was repaired and upgraded in 2015. The submarines of the class carry eight 650-mm and 533-mm torpedo tubes, with an ammunition load of 12 and 28 torpedoes for each type of the torpedo tubes respectively. All missiles of the Kalibr system will be launched via the 533-mm tubes. As of now, there is no information on the number of torpedoes subject to replacement with cruise missiles of the Kalibr system. Presumably, each of the boats in the class will be furnished with 12-14 3M-54 antiship missiles or 3M-14 land-attack ones. Thus, the massive cruise missile attack capabilities of the Northern and Pacific Fleets will increase. The Project 971 third-generation nuclear-powered attack submarines are designed for eliminating surface combatants, submarines and land targets with torpedoes and cruise missiles of the 533-mm and 650-mm calibers. The submarines carry Type 65-76 torpedoes, antisubmarine missiles, Granat (SS-N-21 Sampson) cruise missiles and a lot of mission equipment, including the MGK-540 Skat-3 sonar. They feature high acoustic stealth typical of third-generation submarines. The Project 971 submarines are on a par with the US Navy’s Los Angeles-class boats in these terms.